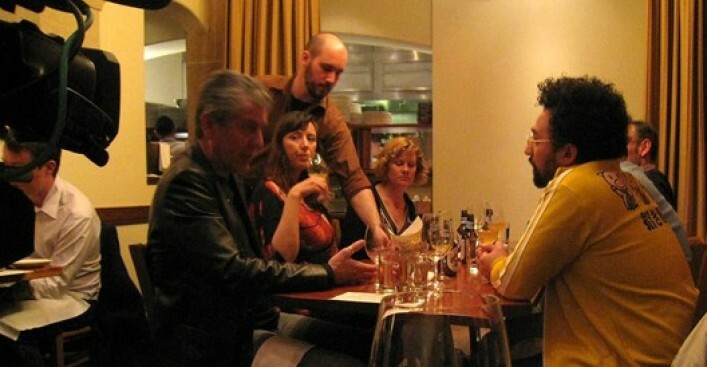 Anthony Bourdain sits down for a meal in one of San Francisco's many restaurants. For the past few days, the inimitable Anthony Bourdain descended upon a number of local eateries, to the delight of many. He capped off his trip with the dinner everyone knew he couldn't miss: last night's head-to-tail extravaganza at Incanto. The above shot comes courtesy of Random Foodnotes, and depicts a six-top featuring Tony, Tatiana Graf, Mary Ladd, Oscar Villalon, Boulevard's Ravi Kapur and Harold McGee. We've shared a few of the other sightings as they've happened—e.g., Red's, Tadich, Pirate Cat—but we confess that we've been holding out on you, and there are plenty of other sightings yet to be revealed. It's still anyone's guess as to which meals will make it on the show, but now that he's departed our fair city, we thought we'd round up all the (confirmed and rumored) whereabouts of one Mr. Bourdain.